So, Azer has been on Reglan for almost a month now. It has worked beautifully. His constant constipation has gone away. For nearly the first time in his life, he has been able to eat what he wants, when he wants. He has no bloating, reflux, or feelings of fullness. All symptoms of gastroparesis have gone. At last clinic, we decided since it was working so well, they would fax in a month's long prescription to the pharmacy. Unknown to me all this time, it is a black box drug. In other words, potential bad side effects. The nurse called me to tell me about a potential side effect called Tardive Dyskinesia. This is basically a condition that could permanently affect the nervous system, and can cause involuntary movements of voluntary muscles. I read on a CF website about someone's daughter who had severe facial twitches after being on Reglan. This terrifies me and sorrows me at the same time. I have stopped the Reglan immediately. The possibility of him developing TD is around 15-20%. I stopped Reglan last night, and his bloating, reflux, feeling of fullness came back immediately, as did diarrhea for some reason. I called the pharmacy to cancel the prescription. I was able to talk to our GI doctor, and we are going to try another medication over the weekend. It is an antibiotic, but can treat gastroparesis as well. We have tried it in the past, and it resulted in him constantly vomiting. I really hope this does not happen this time. This whole thing has been very upsetting to me. 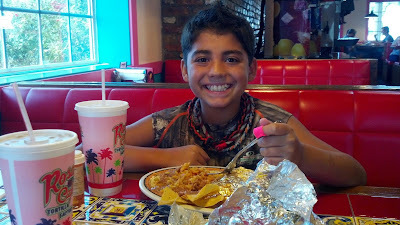 I mean, I was so happy for him that he was able to eat normally, and feel what enjoying food feels like! But at the same time, absolutely terrified that he took this medication that could have had disastrous side effects. I thank God that this did not happen, but I feel like I should have been warned about the potential side effects BEFORE he took the medication for the first time. 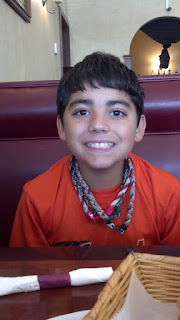 About two weeks ago, Azer was stilling having reflux issues, so the GI doctor decided to switch him from bethanechol to reglan which can be used to treat gastroparesis. While it hasn't made the reflux/vomiting completely go away, it has helped significantly. Currently, he has only been having food come up if he is running or playing aggressively. The GI doctor said there is little they can do about that, because most of what is in his stomach is usually just formula, and it is easier for liquid to come up than solid food. So, yesterday, both the GI and Pulmonary doctors were very pleased. He is now 95 lbs, which puts him around 60th percentile for weight. The ideal weight for a CF person is 50%, so we are doing fantastic. On the growth chart, it looks like a straight line up. His height is finally starting to creep higher above the 10th percentile. It is moving slowly in the right direction. When the pulmonary doctor came in, she said that the GI doctor was grinning out in the hallway. His weight is high enough now to have to move up to a higher strength of enzymes and he hasn't seemed to have as much constipation since we started the Reglan. His Fev1 was only 83%. However, the doctor said they now have a new computer system they use for PFT's. She showed us based on the volume of air he blew out, that his total volume is increased compared to last time. She believes his Fev1 was actually in the 90's because of this. I was grateful for her taking the time to explain and compare the test. She listened to his lungs and she said he had great airflow and no wheezing at all. She mentioned that the pushing technique I do after CPT helps clear the mucus out of the smaller airways, so on we must continue! So, the results from the endoscopy biopsies are... he has no sensitivity to lactose or sucrose, but he has superficial gastric inflammation. They are not sure what is causing this, and so far the only suggestion is to increase his Nexium to twice a day. He has vomited once since we have done this, and seems to be still having reflux, but mostly in the morning. So, hopefully the double dose of Nexium will take effect soon! Despite vomiting, he is continuing to steadily gain weight, and he is over 90 lbs now. I hope his height will catch up with his weight, because shopping for all new clothes has been challenging! 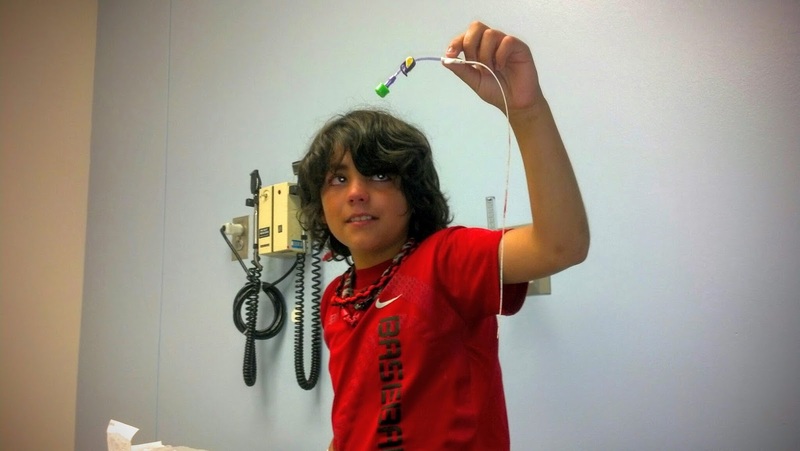 Our GI doctor wanted to do an endoscopy on Azer in addition to the gastric emptying he had a few weeks ago. 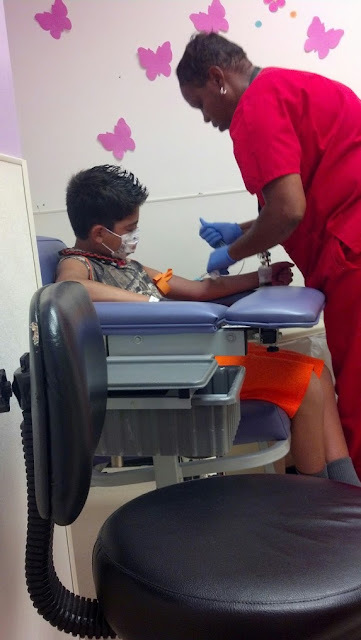 This was to see if there are any visual reasons why he is having so many issues with vomiting and reflux. The procedure only lasted about 30 minutes. The GI doctor told me that he looked like he had irritation to his stomach. 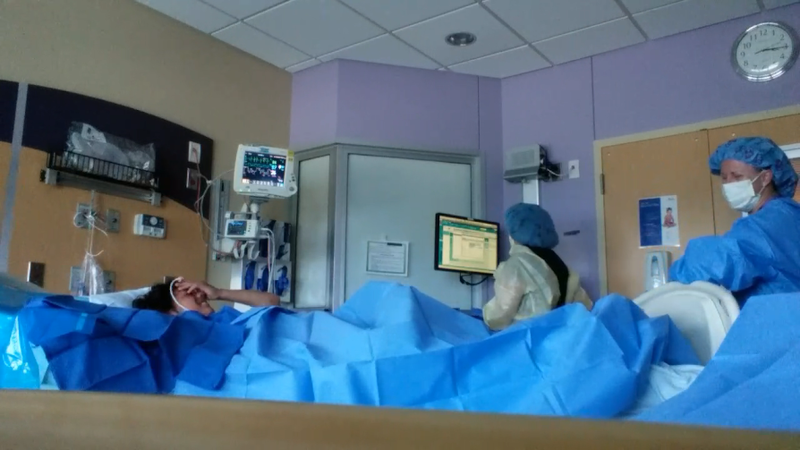 She took small biopsies of his stomach and small intestines to see if there were any issues she couldn't see with just the camera. She also put a new G-button in, as the old one had lost a lot of water, and also put a longer button in, as his old size was fitting kind of tight. 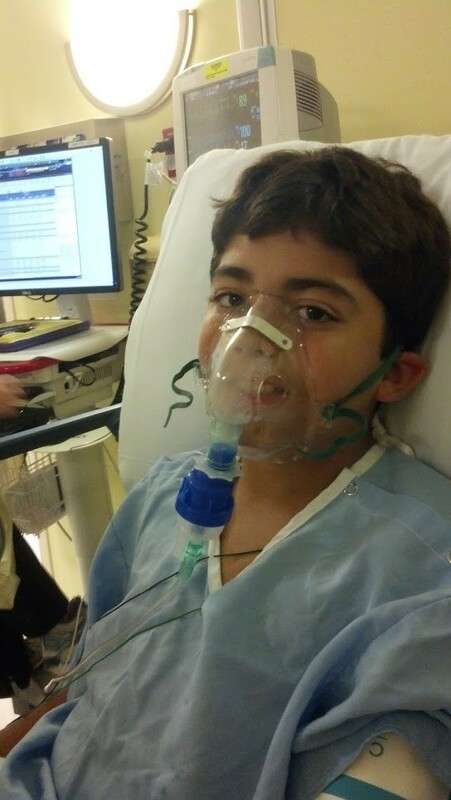 He's had a cough for about a week, but nothing serious enough to hold back the procedure. 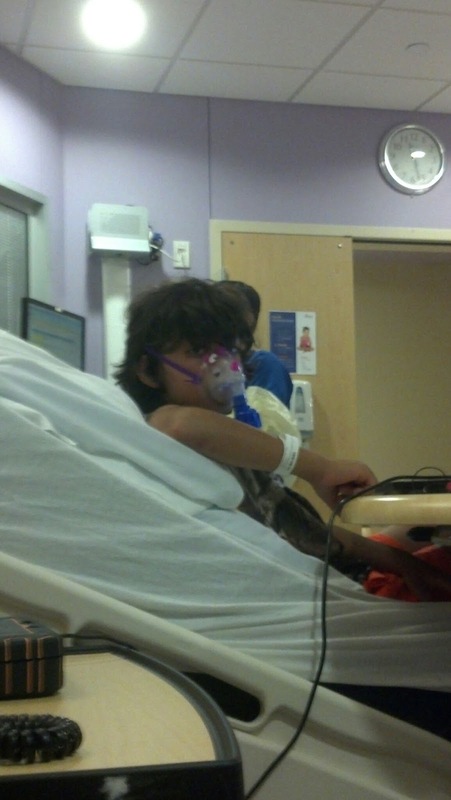 When he woke up, he kind of gave the nurses a bit of a scare, as he couldn't stop coughing. They had to do several treatments of a Xopenex. It seemed to help him breathe better. When they were confident that he could breathe fine, we were allowed to leave! He was kind of woozy the rest of the evening, but he was able to hold down a little food, and tolerated his night feed just fine. Oh, and also he weighed in at 89.9 lbs yesterday! Lets just hope he starts growing on his own now! So, today was one of those longer clinic days. He had to be fasting starting at midnight for his glucose test today. They drew blood for a number of tests when we first got there. He then had to drink a few cups of glucose solution and wait two hours. He weighed in at 86.8 lbs today! He gained almost 8 lbs in just two months. It appears the higher calorie formula is working! On the down side, he just didn't grow much at all, and hasn't, even since increasing his caloric intake. We will see an Endocrinologist in a few months who may have some ideas as to how to handle this issue. We hope his body will kick it in gear and start growing now that it has some extra nutrition. About two weeks ago, we had a week of vomiting only in the morning. After switching his morning medications to afternoon, it seems to have cleared up, but he is still having reflux frequently. 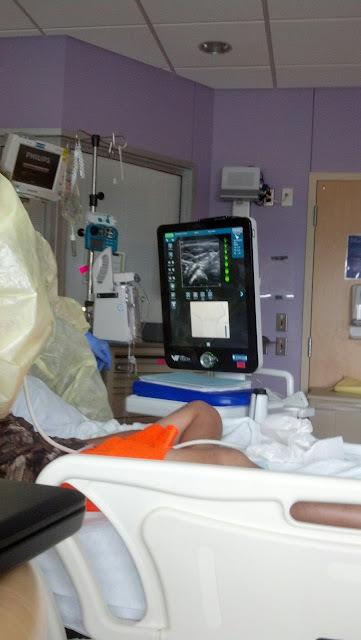 Because of this, the GI doctor wants him to have a gastic emptying scan to see if his stomach is holding onto food for too long. She also wants to do an endoscopy to check for any other issues that could cause problems. He got an 83% Fev1 on his PFT. It's down about 10 points from last time. Because it seemed like the Symbicort worked well last month, we are going to start it back up to see if the decline is related to his asthmatic/allergic components. After the two hours passed, they pricked his finger to test his glucose again, which came back normal. No CFRD! (CF related diabetes). Later on this week, we are scheduled for the gastric emptying study. After fasting and a long clinic visit, we decided tacos sounded great. About a week off of antibiotics, we started Flagyl to combat possible C-diff in his intestines. The Flagyl seemed to cause more stomach aches and diarrhea than anything, oddly enough. His cough started to come back soon after that. So frustrating seeing as we just finished a very strong course of antibiotics! He has been out of breath during our runs, to the point of not being able to keep up with me (and I run slow, believe me). Another thing that has also been worrying me is that he has been so out of breath while swimming, he is completely out of breath, even with short distances. 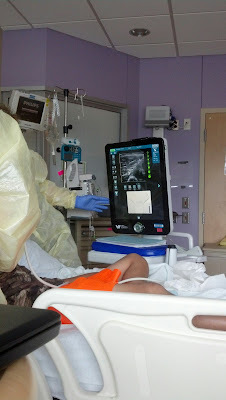 So, of course we increased treatments to try to clear out any extra mucus collecting in his lungs. I waited a week to see if it would improve any, and when it didn't, I contacted our clinic and saw the doctor today. His Fev1 was down a bit, but not as bad as we thought it would be, given how the cough sounded. The doctor looked over his allergy test he had when he was in the hospital last month, and while he was mildly allergic to "everything", his IGE to a certain type of grass was literally off the charts. She believes he is having a horrible time breathing because of allergies. So, we have a plan to start a different inhaled steroid, and to also add OTC allergy medicines to try to calm his asthmatic component down some. On the plus side, he gained a few more pounds and also grew, so the higher calorie formula is working well! Another thing we learned is that adding salt to his boluses do not work. It causes stomach irritation and very bad reflux, so we have stopped that for the time being. We will see if the allergy plan works and hopefully it will and we will stay off of antibiotics for a while! 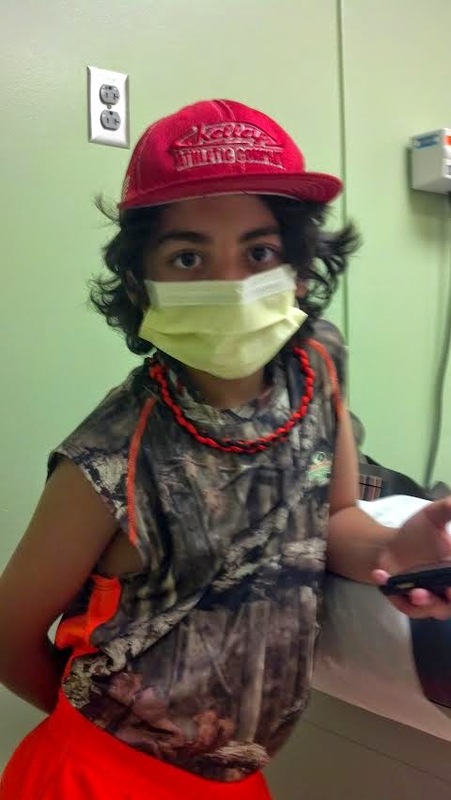 Yesterday was Azer's follow up appointment with our CF doctor. We have been working hard to get his lungs clear by running in the mornings again (until he sprained his ankle Tuesday lol), and manual CPT. The GI doctor was able to get his reflux under control to the point where he has had almost no trouble with it at all, so coughing all the junk out has been much easier. 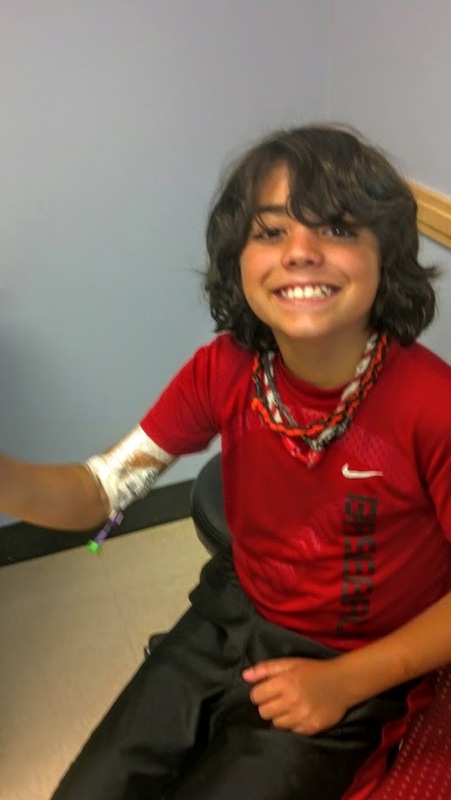 Doing IV's at home is always a bit challenging, but in the end, it is always worth it for him as he gets to play with his friends and ride bikes. Of course, there were moments of longingly looking at the swimming pool. We have been very vigilant about keeping up with the bolus feeds, and saw the rewards of our labor. He is nearly 77 lbs, and for the first time in his life, he is finally over the 75 lbs! He also grew about a quarter of an inch in a month. The doctor still wants to see his weight closer to the 50th percentile, and hopes if we get his weight higher, that his height will inch back up towards the 25th percentile. He got a 92% on his PFT's. I was surprised it was lower than when he was in the hospital. The doctor took time to explain that because he got taller, the calculations for lung volume can change slightly. I feel like no mater how many times they explain what all the other numbers on the PFT's mean, it still never makes complete sense! The doctor felt like Azer had spent enough time on IV antibiotics to have his PICC line removed yesterday. Because Azer has been playing a lot outdoors, he has been sweating too. This can cause the sticky dressing to come lose, and expose the wound to infection, so we've had to use extra dressing to keep it on. The removal of the actual catheter isn't painful at all, but removing the dressing (or any dressing changes) can be very painful. It is much worse than removing a band-aid, as the special dressing they use is meant to stick as well as stitches. Cleaning the area stings as well, because removing the bandages does cause some skin irritation. We are going to do another week of oral antibiotics just to make sure that he stays clear for a good while. Luckily, his sprained ankle is healing quickly, and he was able to get some batting practice in for the first time in two weeks! 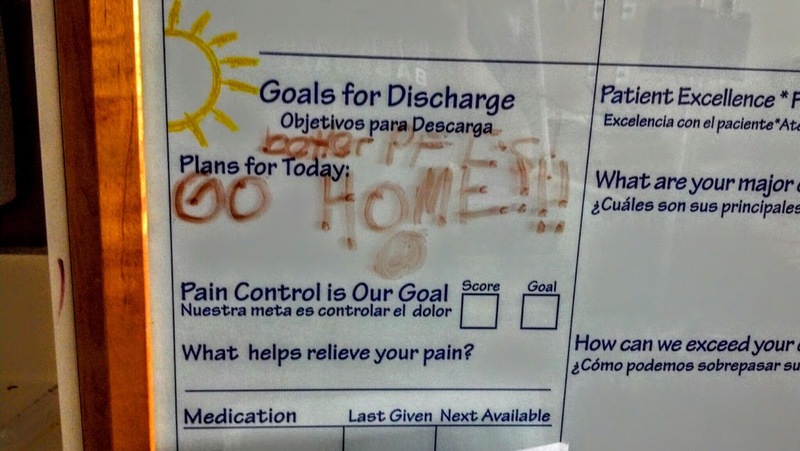 So, our GI doctor has been out of town, which was part of the problem of treating his reflux in the hospital. Yesterday, his reflux was terrible, and he couldn't hold it down about an hour after his afternoon bolus. It was a little scary, with the poor kid retching and crying in pain. I can't deal with vomit, so he was trying to shoo me out of the bathroom. He was so bloated after, even though his stomach was pretty much empty. I called the CF Clinic, and was very grateful to have someone answer the phone (do to some awesome people :-) and she was able to get a hold of the GI doctor quickly, and we made a few small changes to make it through the night. We went to clinic this morning. We didn't do another PFT since we had one just a few days ago in the hospital. He somehow managed to gain a pound and grew a bit. We increased dosages of a few medications (bethanechol and zantac), added some new medications, some to help the stomach empty, some to help the stomach hold food better, and some to try to coat the irritation (Carafate). I learned today that when he has a lung flare up, it can also cause inflammation in other parts of his body, and can cause his GI system to work even slower than it normally does. So not fair for someone who needs to eat more when he's sick! The doctor mentioned a new type of Proton Pump Inhibitor that has helped a few other patients. 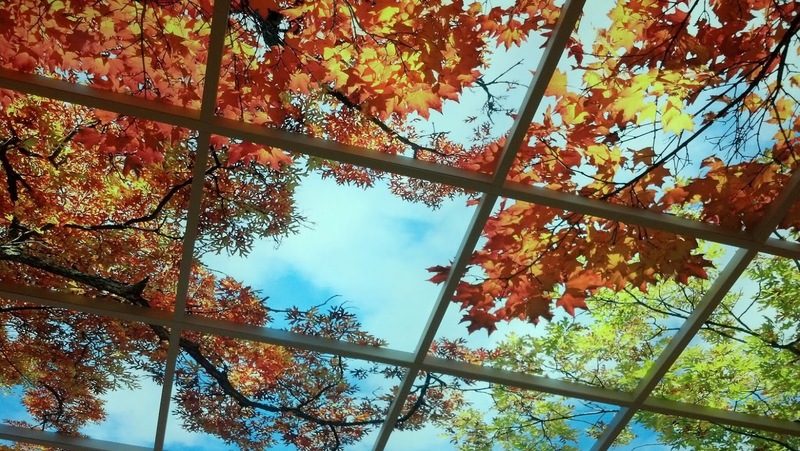 It might be tricky to get it, but we're hoping. 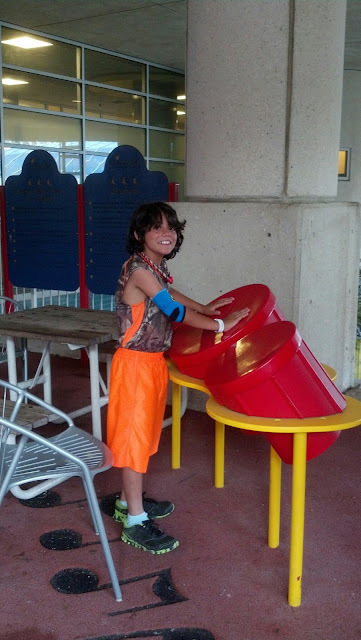 We had a dressing change on his PICC line today. We plan to do one next Thursday, or possibly have it taken out! We might get an endoscopy done when the IV's are over to make sure there aren't any other issues causing his reflux and tummy troubles. We were discharged last night with all our IV medications and supplies, and we had a successful night. This time, instead of having a pump (or those horrible gravity fed IV bags) we have infusion balls. Many other CF moms have mentioned how easy they are to use, and they really are. There is no priming, adjusting dosage, or air bubbles to prime out. It still is exhausting waking up multiple times during the night to change medications, flush the IV, and disconnect his G-tube. 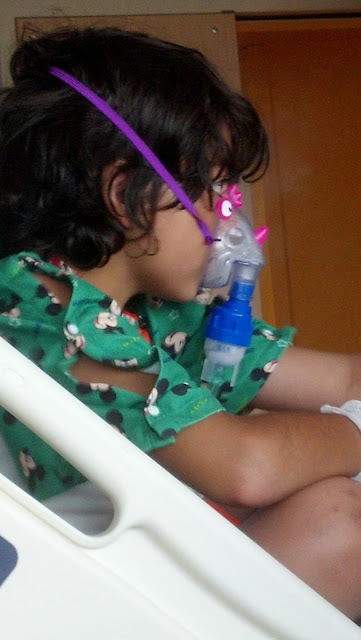 We also have 4 breathing treatments during the day. It is tiring but well worth being at home. We were able to jog this morning, although he had very bad reflux before and during it. I feel frustrated that it isn't any better, or perhaps worse since we were admitted but I am hoping it will be resolved soon. Yesterday, Azer blew 94% FEV1 on his PFTs. After only a few days on IV antibiotics, his lungs have improved considerably, so the plan is to continue the IV antibiotics at home. They are also waiting to see if he cultured any Aspergillus antibodies. His IGE level was elevated but not considerably high for him. His CT scan on his sinuses came back. Apparently, they are quite blocked and there is scarring and thickening. He had no obstructing polyps. 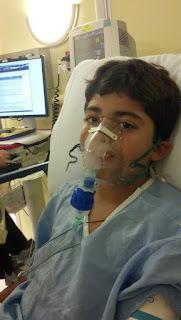 The plan is to do a special sinus nebulizer after we are finished with the IV antibiotics. It seems like the reflux hasn't really been addressed yet. The increased Zantac hasn't improved things. The latest I heard was we are going to restart the Nexium and continue with the Zantac. He is ready to GO! He did very well with Versed through the IV. 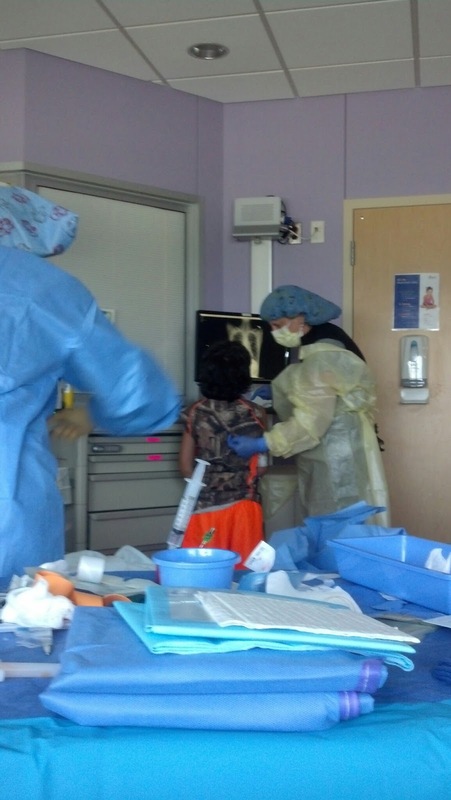 The PICC line team did an awesome job like they usually do. They were able to do it in the room this time, which was comfortable for him. 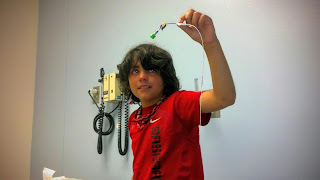 When the Versed started to wear off, one of the technicians showed Azer where his PICC line was placed through the X-ray. The good news is he says his lungs are already starting to feel clearer. We had some time enjoying being out of the hospital room for a while too. They came in and looked for a good place to thread the PICC line in. Apparently he didn't need to be NPO, so since he hasn't had any food or liquids by mouth since midnight, he is going to eat now! 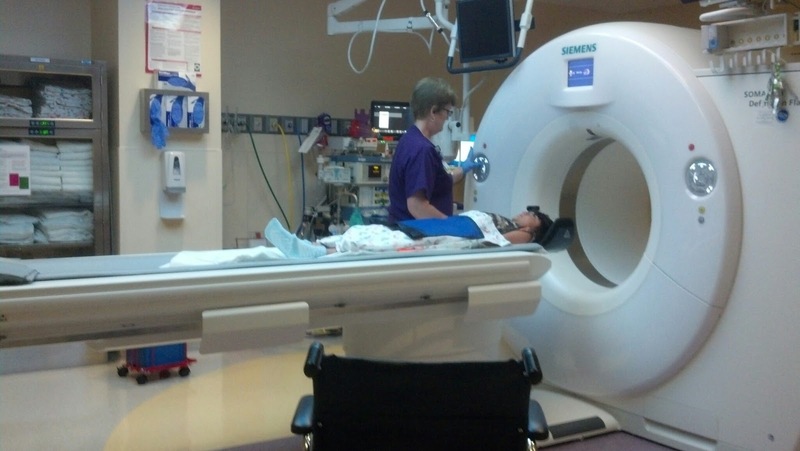 He also got a CT scan done on his sinuses to check for polyps or blockages that may be affecting his lung function. 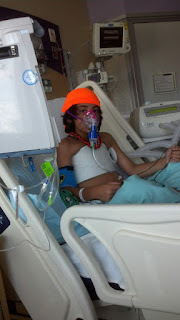 He is also getting breathing treatments 4 times a day. Well, since we knew this admission was coming, we made the most of the time we had after school got out. We swam to our hearts content, and he played one more baseball game Thursday. 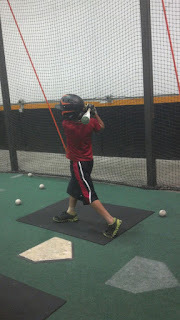 He is missing a tournament this weekend, but hopefully he will be done with IV's before his World Series tournament in a few weeks. We got here late last night. It always seems to take a while before a bed is ready (popular place lol). He got an IV last night, and has been NPO since midnight. 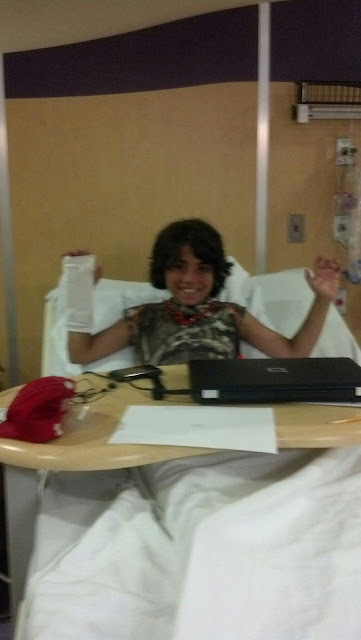 We are hoping to get a PICC line placed soon so he has use of both hands. He can't play his Nintendo very well with only one hand. He is hungry since he hasn't gotten his morning feed. He is on IV fluids since he can't drink anything either. So, they have increased his antacid medicine to see if that will make any difference. 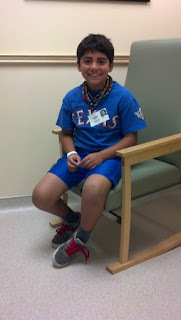 They are planning to do a CT scan of his sinuses before we go home. He only cultured sensitive Staph, but they are going to temporarily treat for Pseudomonas as well just in case it's lurking somewhere in his lungs. He is getting two strong antibiotics through his IV right now. Apparently, his IV was burning last night, but seems to be alright this morning. I hope it holds up before he gets his PICC line. CF creates new words, apparently. The new antacid seems to not be working after all. This is the worst I've ever seen it. 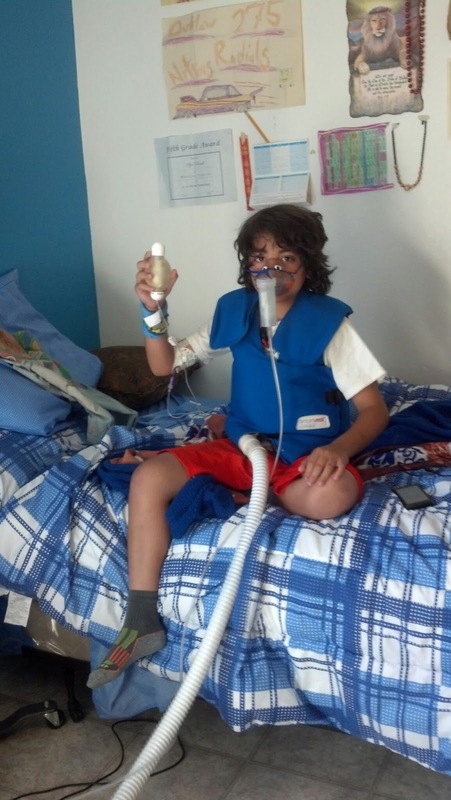 I feel like we're not able to do breathing treatments properly because it causes more reflux. I hope they'll be able to fix this in the hospital. I don't know if this is part of the reflux, but he has had a lot of bloating and constipation lately. A few doses of Miralax seems to have thrown that into complete reverse. It is so hard to find a balance! 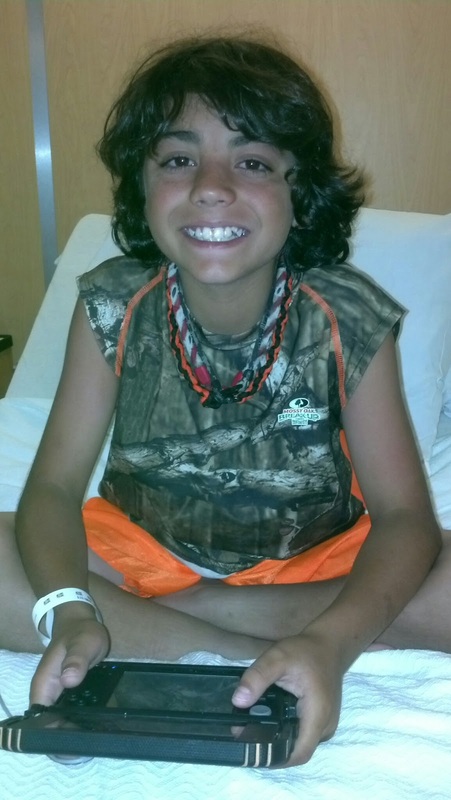 After the last sick visit, he was prescribed some pretty tough antibiotics along with a brief time on steroids. His cough improved temporarily but his cough came back again. So this was a follow-up and sick visit. He gained a few pounds this time (despite his poor appetite) which is fantastic. They are still pushing for more calories because his growth is just so slow lately, and his height percentile is tapering from where it used to be. We will be switching to a higher calorie formula, which should push a few more calories per ounce. He has been having a lot of issues with reflux, but our GI doctor decided a few weeks ago to try a different type, and it seems to be working. We may have to try a course of Flagyl soon if he still continues to have issues. We are also increasing his Bethanechol which helps his stomach move food along faster. His salt was a little low, and I will be adding salt to some of his G-tube feeds as it is a struggle to get him to drink one (1) bottle of Gatorade a day. His Fev1 was 79%. I know it can be much higher. So, we had a choice. 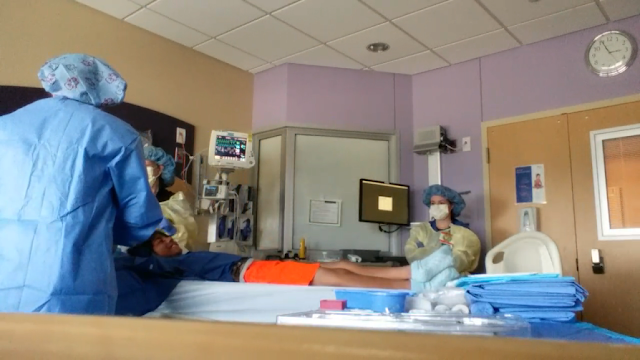 Do another long course of oral antibiotics (the last course just cleared all the bacteria out of his colon and his very hard on his stomach, which means lots of time in the bathroom), or do a course of IV antibiotics to clear him out. Doing IV antibiotics seems to be the best choice at this time. It's been a few years since his last tune up, so it is needed. The good news is he has only been culturing bacteria that responds well to broad spectrum antibiotics. The plan is to wait until school is out, go in for the PICC line and some X-rays, and then do the rest of the IV antibiotics at home. Hopefully this will clear all the junk out of his lungs so he can have a summer free from antibiotics, steroids and IV's! We are still participating in the CF walk this Saturday. It will be rain or shine, so I hope to see everyone there!!! His vitals were great, but his Fev1 was down to the lower 70's. We are doing a course of oral antibiotics and steroids. If there isn't improvement at his next clinic visit in a few weeks, it might be time for IV antibiotics. It's been a few years since his last admission, so we've been pretty lucky. His reflux has been horrible lately. It has been interfering with his appetite and hasn't helped him trying to cough this junk out. 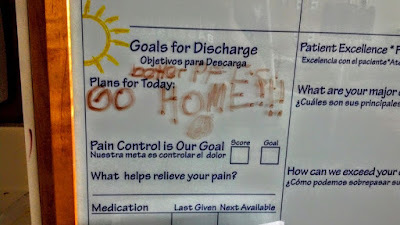 We will see the GI doctor at our next clinic appointment, but in the meantime, they've switched him to a different reflux medication and a higher dosage. 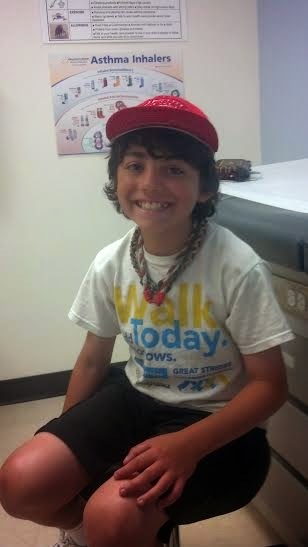 Also wanted to let everyone know that it is 24 days until the CF walk. It will be on Saturday, May 30th at the Vitruvian Park in Addison. Check in time is at 8am and the walk starts at 9am. 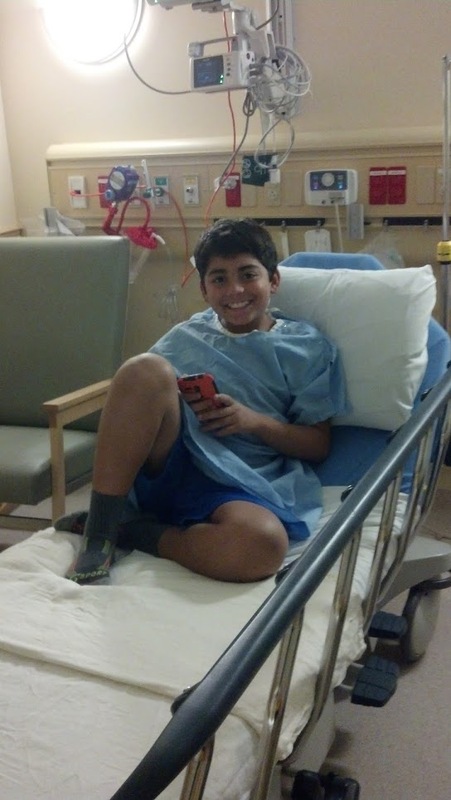 Click here to donate or join our team, Joggers for Azer! At Azer's clinic visit three months ago, the doctor noticed his growth was starting to plateau out. Since then, he has been doing 5 cans of formula a day through his G-tube instead of 4. Three at night, one in the morning, and one when he gets home from school. He gained 4 lbs in 3 months, and grew almost a whole inch. I believe it's working unless his long hair is adding to the weight! He got a few colds over the last few months, and the last one just seemed to stick in his lungs. His Fev1 was down to 81%. He has been junky for weeks. The doctor is putting him on oral Bactrim for 2 weeks unless he has cultured something that would need different treatment. 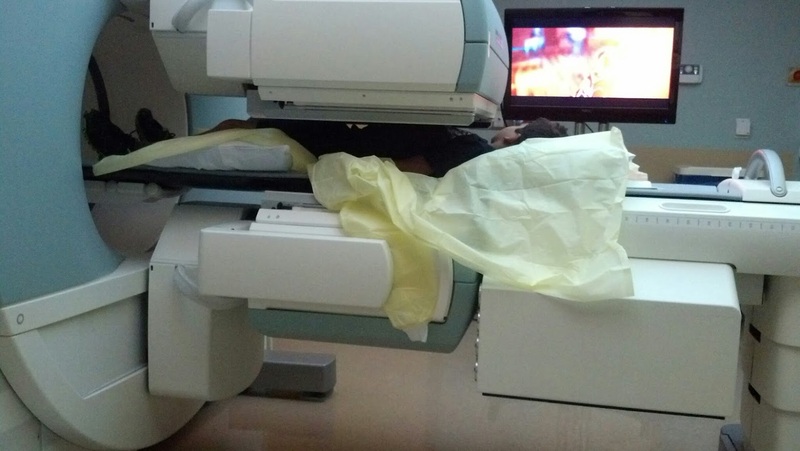 They also tested his IGE level again to see if it's up. I'm really hoping not. I feel like the last ABPA took so long to treat, and he was on Prednisone for months! Hopefully the oral antibiotics will get his lungs feeling better again. He commented recently how much relief he gets from manual CPT and running, so we have been doing both without fail! Azer is still on steroids... a very lose dosage every other day, but still on them. His IGE levels are slowly dropping, and we are still doing labs every other week. The day before yesterday, I noticed he might be coming down with a virus. Last night, after his evening treatment, he had a wheezing noise in his upper right lobe that was so loud, you could hear it without a stethoscope. I called the on-call doctor who didn't have much advice to give other than to continue to do treatments or take him to the ER. He was coughing hard enough he threw up, so I figured rest would do him good. I know he didn't sleep well. Today, he had a fever, and was nauseous, but the worrying thing is his cough. It is very congested. Luckily, I don't hear much wheezing. I have been doing CPT every few hours to try to relieve him. I don't know what exactly has changed in him, or his lungs lately. Perhaps there is still remaining inflammation from the ABPA. But this past year, whenever he's gotten sick, the wheezing can be terrible. It can be so loud that he needs a fan in his room full blast so that it covers up the noise so he can sleep. I've been getting a sense, for the first time, that Cystic Fibrosis and that horrible mucus is just so hideous. It's just horrible how quickly his lungs can get full and irritated seemingly overnight. That we can work for months and months getting him to gain several precious pounds, and one little virus can take it away in a week. 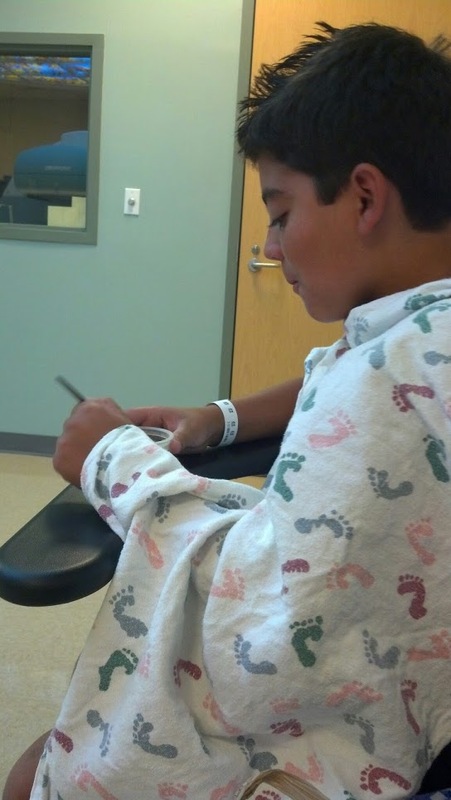 While everyone else's kids get a cold and stay home for a few days and be perfectly fine, he has to be on antibiotics and steroids for weeks, sometimes months. I just know we have to keep working hard, doing breathing treatments, CPT, running, praying... whatever it takes.